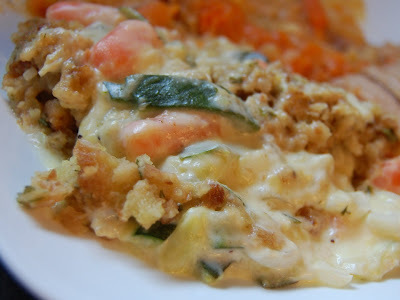 There are some dishes that just don't photograph well, and casseroles are included on that list -- as I learned over the weekend, when I was trying to take a decent picture of this zucchini casserole. So the picture may not look very appetizing, but I hope you don't let that deter you: This is one delicious casserole, and it's my favorite way to eat zucchini. I like this even more than I like zucchini bread, and that's really saying something. This is my Aunt Mary's recipe, and I've been eating it ever since I can remember. I make it now exactly the same way the recipe is written, because this casserole doesn't need a single change in order to be delicious. It's creamy and buttery and flavorful and pretty much the very definition of comfort food. Not the healthiest thing in the world by any stretch of the imagination, but it's really hard to care about that once you've tried it. 1. Boil carrots and zucchini until vegetables are fork-tender. Meanwhile, prepare stuffing mix according to package directions, then stir in melted butter. 2. Stir together cream of chicken soup, sour cream, and black pepper in a large bowl. Add zucchini, carrots, and onion to sauce mixture and stir to combine. 3. Pour into a greased baking dish and top with stuffing. Bake at 350 degrees for 45 minutes. I make this for a fast weeknight dinner. We add chicken and cheddar cheese and use chicken broth to moisten the stuffing instead of the butter (saves a few calories).